Laughlin is a small resort town on the banks of the Colorado River, located at the southern tip of Nevada, 90 miles south of Las Vegas. It is the geographic meeting point of San Bernardino County, California, Mohave County, Arizona, and Clark County, Nevada. This hot, dry region, where the Mojave Desert meets the Colorado River, is known as the tri-state area. One of Laughlin's water taxis on the river. 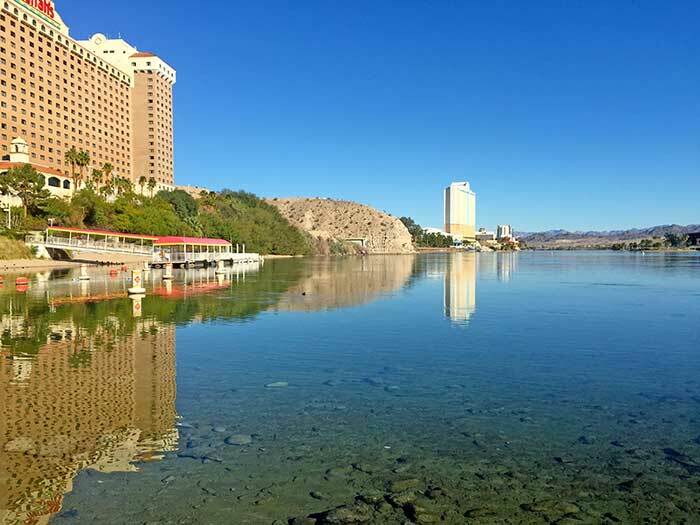 Hotels/Motels in Laughlin, Nevada with location maps and nearby attractions. 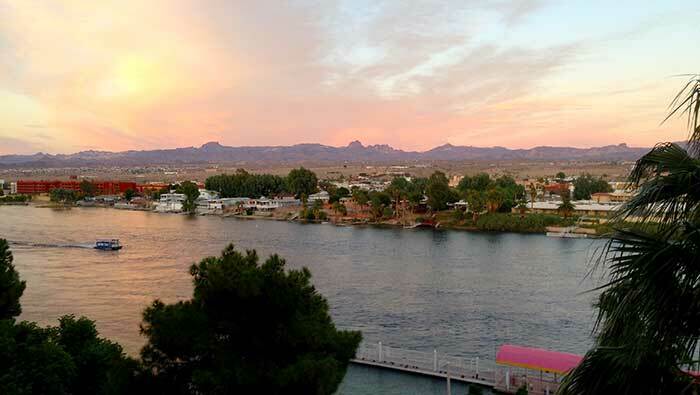 Lake Mohave Resort at Katherine Landing (928) 754-3245 RV parking at most major Hotels. Davis Camp - Tent sites and RVs and campers on the Arizona side of the river in Bullhead City, Arizona. Backcountry camping: Along the shores of Lake Mohave and along designated sites on unpaved roads. Laughlin is located in Clark County Nevada, annexed in 1867 from the Arizona Territory by the State of Nevada as part of Lincoln County. Clark County was formed in 1909 when Lincoln County was divided. From a population of 3,321, growth in Clark County remained slow until the Great Depression when government projects such as Hoover Dam drew laborers to Southern Nevada. The Flamingo Laughlin became the Aquarius in October 2006. 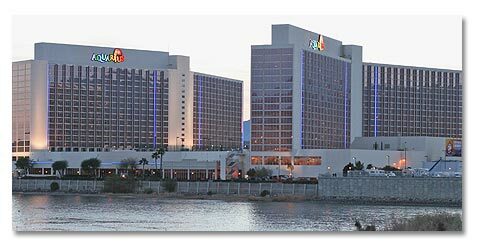 The Aquarius is the largest hotel and casino located in Laughlin. Harrahs at the south end of Laughlin has a beach on the river. Oatman: Arizona town reenacts the Old West with staged gunfights in the middle of town. Chloride, Arizona: Chloride has been served by both stage coaches and trains during its colorful history. The Chloride Post Office, also established in 1862, is the oldest continuously operating post office in the state of Arizona. Grapevine Canyon: Many of the Indians gathered here for water and meetings. The signs on the rocks tell many stories of the past and give instructions on the local conditions. Katherine Mine: Katherine's Landing takes its name from the decaying Katherine Mine, located northeast of the current Marina. Davis Dam: Constructed by the Bureau of Reclamation downstream from Hoover Dam, it impounds Lake Mohave. Fort Mohave Indian Reservation: 41,884-acre home of the Mojave, noted for their basketry and beadwork. River and lake reports for boaters - click here for river information. Annual Laughlin Leap, where off-road vehicles and monster trucks compete for cash and bragging rights in a contest that sees these vehicles fly off a dirt embankment, leaping more than 100’ through the air. Saturday and Sunday Laughlin will host SCORE Desert Challenge Off-Road Races. Always held the last full weekend in April, there will be motorcycles as far as the eye can see! More than 50,000 bikers from all walks of life enjoy top-name entertainment, a poker run, displays, competitions - including awards for the best custom motorcycle in the bunch - and thousands of vendors in the West's largest ride-in bike rally. Traditionally, these are 20-minute fireworks displays launched over the waters of the Colorado River, offered July 4th. Among the most spectacular displays in the West, these fireworks are choreographed to music on a high-fidelity sound system and broadcast on area radio stations. 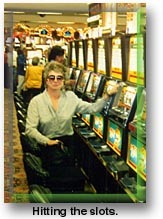 Free to the public with best viewing at the Laughlin resorts and casinos. Features several vendors showcasing unique and beautiful handmade items such as belly dancing apparel, jewelry and beaded items, hand-crafted women's fashions, home decorations, sculptures, candles and much more! This family-friendly event has something for everyone. Holiday Boat Parade of Lights November of every year. Light up your boat, invite your friends and help kick off the holidays Laughlin style! Join in the fun as festive decorated boats make their way up and down the Colorado River. Off-Road in Southern California's deserts, check out our Mojave Road Guide (Starts off of RT 95) and The Bradshaw Trail. (near I-10) These hard to find guides will take you on a adventure through time. Boulder City, Nevada: 70 miles north. Henderson, Nevada: 84 miles north. Las Vegas, Nevada:: 94 miles north. Bullhead City, Arizona: 2 miles east. Needles, California: 30 miles south. Mojave National Preserve: 63 miles west. Lake Mead National Recreation Area: 70 miles north. Lake Mohave: 20 miles north. Mojave National Preserve: The Desert Protection Act created the 1.4 million-acre Mojave National Preserve in the heart of California's Mojave Desert. Big Bend State Recreation Area: The state of Nevada preserves this area along the banks of the Colorado River south of Laughlin. Dead Mountains Wilderness Area: 48, 850 acres in the eastern Mojave Desert (BLM). Havasu National Wildlife Refuge: Created for waterfowl, this is a wintering habitat for snow geese and other waterfowl.